The Ecclesiastical Museum is located amongst the buildings of the Holy Monastery of the Apostle Andrew of Milapedia in Peratata. Established in 1988 by the then Metropolitan Spyridon, it is housed in the old church of the Monastery, which was the only building to survive intact in the 1953 earthquakes. 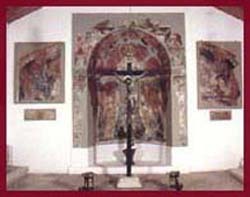 In the first chamber (the vigil room) there are frescoes from the church of the Archangel, Milapedia. The Shroud of the National Martyr and Patriarch of Constantinople Gregorios the 5th. The Epitrachilion (ecclesiastic stole) of Saint Nectarios. The shirt of St Panagis or Papa-Basia. The area of the main church survived in its original form. It houses the amazing iconostasis (icon screen) which was carved at the beginning of the 17th century. In the northern narthex (vestibule) you can see the relics of the Monastery, along with icons belonging to the Archdiocese of Kefalonia. The display cases along the sides feature the handiwork of the nun Romila, whose gold-threaded embroideries are finely-sewn masterpieces. Displayed in another case are the Pastoral Staff and Chalice belonging to the Archbishop Nicodemus II Metaxas. Two handwritten epistles from St Kosmas of Aetolos dated 1777. The Archiepiscopal Saccos of Kefalonia, embroidered by the nun Theodora Kanali in the years between 1715 and 1721.